Paintings are available at Saatchi Art, Artworx Gallery Goolwa South Australia & Art Dealer Melbourne. Please email for contact details. Artist Statement: "As an artist, I am compelled to go beyond a purely decorative visual connection between the artist and viewer, to a place where my work is a catalyst ofdiscussion, challenge, or humor. My works engages the viewer and I am fascinated by individuals reactions and interpretations"
South Australian artist Chris Wake was a finalist in the 2008 Sovereign Asian Art Prize a high profile, international art prize covering the whole of Asia, Wake was one of 30 finalists selected out of over 1100 nominatedartists Paintings were exhibited at the Nanyang Academy of Fine Arts, then Hong Kong for final judging . The eminent judges came from around the world including curators from Tate Modern, Guggenheim museums. The paintings were then auctioned by Sothebys Hong Kong with Chris Wake`s painting “Dali is Not So Crazy” achieving the second highest price out of the 30 lots auctioned. With more than 18 solo exhibitions and 40 group exhibitions some of which have been sell out shows Chris Wake`s reputation continues to grow . 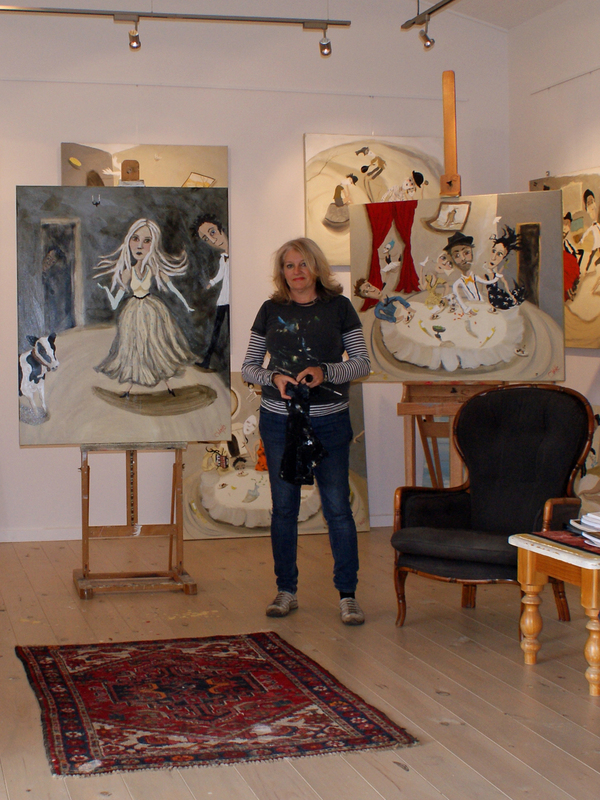 Chris Wake is represented by fine art galleries in Australia and overseas and her work is in private and corporate collections. Chris Wake was born in Adelaide in 1960, and has been painting since 1976 . The current theme of her work is about global warming, the water level is rising and the animals are rescuing us. A satirical comment about man`s inability to take care of the planet and to share it peacefully with other species. These large oils on canvas exude a kind of wild energy, as if the characters are caught in a high wind. The fish eye perspective, the twisted glasses and bottles and fluid body shapes are reminiscent of Chagall. Jugglers’ balls, a flying dog, a red dress, bring bright spots of colour to paintings that are otherwise rendered in neutral greys and browns. A strange raft of often recurring Characters with Nolanesque eyes include extreme opera divas, karaoke Queens, Clowns, managing directors and sea captains. Animals feature also - flying dogs, pandas and hyenas as a reminder that to live in harmony with other species. Wake`s paintings encourage interaction with the viewer and always evoke a unique response, this is exactly what the artist is aiming to achieve with her work. Chris Wake studied Fine Art at Adelaide Central School of Art and has been painting since 1976. Wake`s paintings are now much sought after by corporate and private collectors in Australia and internationally.